Tomorrow night (Tuesday, November 13), the Grand Rapids City Commission is expected to vote on the issue of adopting a wage theft ordinance for Grand Rapids. Wage Theft is a serious problem in the US, where workers are not regularly paid for the amount of hours they actually put in. Because of the growing awareness around Wage Theft, some communities have begun campaigns to both educate the public and get municipal governments to pass a Wage Theft ordinance. You can see which states and cities have adopted or are working to adopt such an ordinance across the country. We asked Wage Theft organizer Jordan Bruxvoort a few questions about the campaign. in Grand Rapids? If adopted, our wage theft proposal will create a means by which businesses that have contracts with the city and commit wage theft will face meaningful penalties (such as not being paid by the City until all workers who were victims of wage theft by that company are fully compensated and then being suspended from applying for City contracts for two years). It will also help ensure that City contracts go to businesses that have a clean record on wage theft (City contracts will stipulate that businesses certify that they have not engaged in for the last two years). 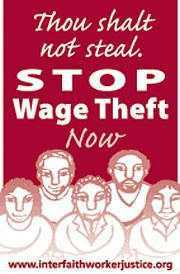 2) How will the City enforce the wage theft policy? The Micah Center will be in conversation with the Michigan wage and hour division and the federal wage and hour division to report back to the City the findings of these agencies regarding local companies that have City contracts to the City’s Office of Diversity and Inclusion who will then take the specified actions against offending businesses (withholding payment and/or suspending businesses from applying for contracts). For anyone who wants more information on the Grand Rapids Wage Theft Campaign and how they can get involved they should contact Jordan Bruxvoort, Associate Director of the Micah Center at: jordan.bruxvoort@gmail.com.